The oldest rugby player I've ever seen was in a match I refereed in Christchurch, New Zealand. It was part of the Golden Oldies Rugby Festival, where some 4,000 players - all of them over 35 - congregated for a week of revelry and devilry. He was Italian, and showed up at the tournament wearing a Roman Legion gladiator tunic and feathered helmet. He was 96. He wore purple shorts during the match against an Australian side; the purple is the Golden Oldies signal that he is over 65 and is not allowed to be touched - not just not tackled or held, but not touched at all. You get brittle with age, but this guy was robust and seemingly flexible. That's what a lifetime of rugby will do for you. He scored a try during the match. He stepped onto the pitch once his team managed to get the ball to the 22 and they handed it to him. As no score is kept, this infraction meant nothing. The members of the other team, in a wonderful demonstration of sportsmanship, dashed in front of him and he proceeded to "knock them backward" with a stiff arm. All 15 players fell to the floor as he went in-goal to ground the ball. He bent toward the ground slowly, an inch at a time, and that's how my arm went up to signal the try, in tiny increments that seemed to take a full minute. When the whistle went, a cheer went up from both sides of the field - truly a heart-warming moment. He scored twice that day. Old Boys hurt more because we're older. Don't bother describing how much more intense your first side match is, and how much more sore the bruises are - that's immaterial. It's sort of like Farina's comment to a barnyard animal in an Old Gang short: "Chicken, I is four times more tired than you because I is four times bigger than you." There is something endearing about the sight of middle-aged men "sprinting" down a field with a rugby ball, doing lineouts and scrums. Incredibly, this happens all across America (and elsewhere in the rugby world) daily, as if rugby wasn't one of the world's toughest and most body-damaging sports. What are those old guys thinking? Well, we're thinking we're young again, and we're regaining the basic joy of running on a field while handling a ball. (And also ritualistically wrapping our heads with electrical tape.) After all, rugby was invented by English schoolboy geniuses; what may have been unexpected is that deep down inside we're still all English schoolboys, the pitch is green and lush, and there's a nice cooling breeze and onlookers interested in watching us play. 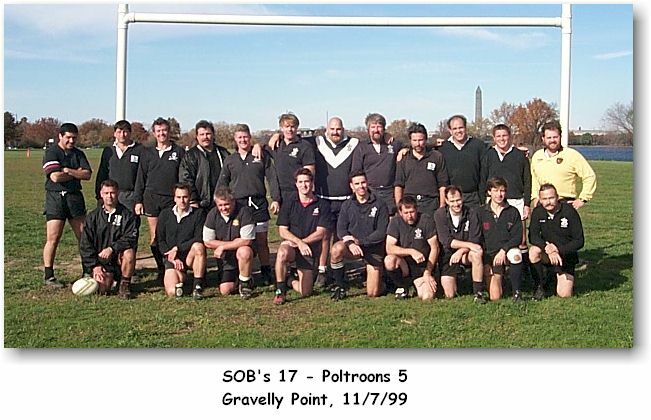 My very first rugby match was an Old Boys game between the Western Suburbs' "Suburbs Old Boys" (S.O.B.s) and our arch-rivals, the Poltroons. Apparently sometime in the past the Poltroons wouldn't allow guys from our club to play with them, so we formed an Old Boys side of our own more or less for the express purpose of taking them on. (Nyahh, nyahh!) But the Poltroons are a class act, with an admirable sense of fun. Their jerseys feature a yellow streak down the back, and their club patch features a little beer mug with the motto "Hostile - Senile - Fragile." I was stunned to see one Poltroon out on the field who was described to me as being 65. (As Buzz McClain points out in his sidebar, while remarkable, this is no record.) I would see some more guys in their sixties at subsequent matches, and this has always heartened and inspired me. Perhaps what Ponce de Leon was looking for is actually found on grassy fields all across America. Old Boys play was described to me as being more light-hearted, recreational and fun. What's more, it's more accommodating to the player who does not attend practice (older men have better things to do). Matches are broken up into three twenty minute periods, with unlimited substitutions and water breaks on very hot days. When this was first described to me by the Old Boys referee encouraging me to learn the game as a 42-year-old, I was heartened. Sounds very fraternal and good-natured, thought I, with nary a bad feeling expressed within the Grand Fellowship of Testosterone. I can honestly say that a majority of the Old Boys matches I've been in (or heard tell of) included a fight of some sort breaking out! So Rugby Lite it ain't. What's going on here? Aren't we supposed to mellow as we get older? Apparently ruggers don't. In complete agreement with Dylan Thomas' admonition to "Do not go gentle into that good night," I've found that Old Boys matches are usually more grueling than the b-side matches I generally play. Why? Old Boys are, on the average, heavier - and it ain't muscle. This extra heft makes pile-ups and scrums unforgettable experiences. If you’re a lock you don't need to worry about getting low if a 290-pound prop is perched on your upper back. The worry is about requiring corrective spinal surgery. Old Boys can be meaner, no doubt about it. This makes sense as people tend to get crankier and more ornery with age. A-siders usually take a more professional approach to play - Old Boys play as if they're physically working out resentments against insolent, know-it-all teenage sons or formidable wives. Old Boys often cheat like mad, and are often willfully off-sides. I've haven't figured out if this is due to senility or the "Who cares?" attitude that is often a precursor to retirement. Not all Old Boys are "old"; around 35 seems to be the entry age. But the admissions standard for Old Boys play that I've seen seems to center on hair. It has to be missing from the top, somewhat gray or growing on one's back. But many Old Boys have kept themselves in pretty good shape. In my first match I was locking with a magnificent physical specimen in his thirties who would have done credit to anyone's a-side. Apparently he was in some career field that allowed him to lift weights when on duty, and the guy was buff. Not mentally all there, but buff. (An ideal combination for rugby.) Also, the Western Suburbs SOB's have a good mixture of former a-siders who can still credibly play a-side. (This is reflected in our current 8 wins-1 loss record over the past three seasons.) One of them - a flanker - is a veritable Mercury, his shock of white hair flying as he bolts down the pitch with those little cartoon whisk lines in his wake. Another SOB, a back, claims he's "…still the fastest guy in the club," and our coach affirms he's probably right. Every Old Boy is a referee, and has the experience and assertiveness to point out where and when infractions of the laws have taken place. This makes Old Boys play an often talky experience. I think if I were a ref, presiding over an Old Boys match would be something I wouldn't look forward to. What's more, there seems to be a lot of kicking in an Old Boys match - very little of it any good. After all, if you're badly out of breath and the ball is within reach, why bend over to pick it up when you can simply kick it and turn the game into a soccer match? Back to our arch-rivals, the Poltroons. It quickly dawned on me that there existed some real resentment for them, simmering just below the surface. In one circle-up during yesterday's match (which we won 17-5, by the way), there was a brief mention of getting and giving "the boot," which I found somewhat unseemly coming from guys in their 30's and 40's. At the time I could imagine two little translucent rugby players perched on my shoulders, each whispering in an ear. The one on the right said, "Now, Brother Brigham, rugby is a game for gentlemen, and gentlemen don't take out their aggressions by trying to maim other gentlemen. Besides, what kind of an example is this for your teenage son? And when in your life have you ever desired to cause physical pain to your brother man?" The other little rugger was dressed in a scarlet jersey with a horned scrum cap and yelled, "Give 'em the boot! Give 'em the boot!" The pack instinct runs high on these occasions - especially if you’re a forward - and it's difficult for one to emphasize the better angels of one's nature; which sort of sums up rugby in a nutshell, doesn't it? So, there we have it. Geezers beating the Kapok out of themselves and each other in a way that would do the English schoolboys who invented the game proud. Old Boys: Your future in rugby! Click here to see a cool photo from a Matt Godek catalog. I don't know who these fellows are in their (significantly) grey jerseys, but Lord love 'em for playing! The New York Vintage Whines have an interesting little description of the various rugby positions as they pertain to Golden Oldies play. Being a forward, I like the phrase "aging trendies" as applied to Fly-Halves. I've got to include a recent photo of the SOB's, of course. Here we are. I'm the fellow with the noble forehead (that is, the balding guy) standing just to the left of the Washington Monument. More of Brigham's senility is on display at his rugby web site, "the Rugby Reader's Review." You may contact him at here.